The Main Topic is usually delivered by an invited guest speaker. 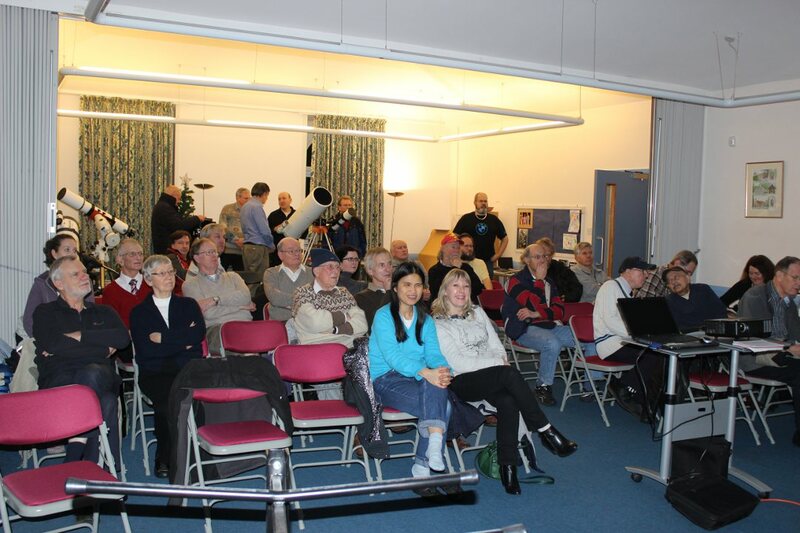 We aim to provide a diverse range of subjects linked (in some way) to Astronomy - whilst the 'Second Session' is typically delivered by one of our members. If time allows, the evening concludes with a short 'What to see this month'. 7.30pm. The evening starts with the Chairman delivering any important Announcements and then introducing the main speaker. 7.45pm (latest). Main Topic Speaker gets up and the lights are turned off. If you arrive after 7.45, please enter the Hall by the first door (on the right, after the entrance) and please be extra careful when finding a seat at the back of the Hall as members often setup telescopes there ! 8.45-9pm +. 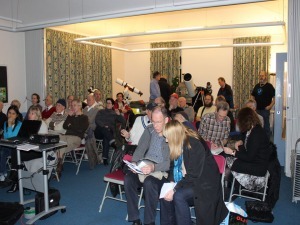 Coffee break during which visitors often chat with members who have set-up their telescopes at the back of the hall. If the weather is good, sometimes members will nip out for a quick look at the sky. 10pm. We aim to clear the hall by 10pm. All our indoor Meetings are open to the public, however non-members are asked to make a contribution of �2 toward the hall hire costs (this may be collected by Fred, our Membership Secretary, at the door on arrival, or left at the 'Tea hatch' at half time). This note last modified: 3rd Apr 2019 23:36. The meetings archive gives an 'overview' of the Society activities over the past 10 years (see also the Events page). Missed a meeting, or can't remember when a topic was last covered ? Here is the archive of past MAS meetings. Friday, 5th April 2019 - Space Weather - Dr. Colin Forsyth, NERC Independent Research Fellow, Plasma Physics group, UCL Colin started by reminding us that plasma is the 4th state of matter. As more energy is put in, first the crystal bonds are broken laking us from solid to liquid, then the molecular bonds are broken taking us to a ga. Finally, the electrons are stripped from the nucleus taking us to a plasma. When this happens, electrons, which are at least 2000 times lighter than the nucleus (of hydrogen) will be moving 2000 times faster. For this reason, huge currents flow in a plasma. Turning to space, we note that even 'empty' space has about one atom per cubic meter. However space in our solar system has far more since the Sun is constantly throwing out significant quantities of plasma, in what is known as the Solar Wind. During periods of sun spot activity, magnetic eruptions on the sun's surface can throw out huge masses of plasma. Known as Coronal Mass Ejections, they follow the suns magnetic field lines outward, pulling the field with them. If the ejections interacts with the earths magnetic field, the plasma can be transferred into our field. This drives the Aurora, however the electrical currents the plasma carries can cause massive disruption to modern electronic systems. For images of the Coronal Mass Ejections, see Solar Dynamics Observatory and the JHelioviewer, especially in the UV waveband. For a simulation of the plasma flow and the Suns magnetic field interaction with the Earths, see NASA Scientific Visualization Studio. As the plasma gets trapped in the Earths field, it heats up, reaching 12,000 million degrees C in the Van Allan belts. Geosynchronous orbit is just within the belts, however the density is low so the direct heating effect is minimal. The electron flow causing induced currents, however, causes a geomagnetic storm which can be dangerous not only to satellites but to any long conductors on Earth, such as power lines. Fortunately, the effects are usually transient, although sometimes poorly designed satellite computer systems, lacking auto-reboot circuits can be off-line until lack of positional adjustments leads to a power failure as their solar cells loose their alignment to the sun. Further, the effects on Earth are usually minor, although the March 1989 Geomagnetic Storm was particularly severe and caused a nine-hour outage of Hydro-Qu�bec's electricity transmission system. There have been more massive coronal mass ejection since, however these have missed the Earth. Even so, the March 1989 CME was taken as a 'wake up warning'. Since then, systems have been put in place to provide warnings to our vulnerable national infrastructure. In the UK, the Met Office is responsible for space weather warnings, in USA it's National Oceanic and Atmospheric Administration. Further, space probes are being planned to study the Sun in the hopes of predicting solar weather and thus the likelihood of SME's. The European Space Agency is launching the ESA Solar Orbiter in 2020, and, in 2021, the joint SMILE mission with the Chinese. Lesley reminded members of the Photo Competition. Closing date is 6th May - so time is running short ! The judge will be Ian Longthorne of Baylis Media. One of the winners of the 5 individual categories will be receive (by vote at the meeting) the Susan Flinders Memorial Award. Full details are on the web site, in the Members section. Aditya Spectroscopy update. Now at Edinburgh University, Aditya gave a report on a project he worked on for EUYSA, the Edinburgh University Young Scientific Research Association. Having previously looked at the emission lines os stars, he assisted two other students in a project to look at nebula emissions. The nebula chosen was M42, the Orion Nebula. Their goals were to address 3 questions - What is the extent of the Nebula ? What is the volume of gas enclosed ? and What elements are responsible for the emissions ? To address the first two, they used the Str�mgren sphere model. To address the third, they needed observational data. This they planned to collect at the The Royal Observatory, Edinburgh, which is sited next door to the University. First, of course, they needed a grating - unfortunately EUYSA funds did not stretch to the fine lone grating, so they had to make do with a basic 100 line grating. Worse, the time they had been allocated on the telescope was washed out by the weather ! Fortunately, Tim H volunteered the use of his telescope and Aditya was able to obtain some good images which he showed us at the meeting. Next the spectral emissions had to be analysed. It was at this stage that he discovered that light pollution had swamped the faint emission spectra image and the lines could not be extracted from the background noise. Although the results were disappointing, huge practical experience had been obtained. This note last modified: 10th Apr 2019 10:37. This page last modified: 25th Jun 2018 16:51. Page Clicks to date: 2173. User 34.228.38.35 @ ec2-34-228-38-35.compute-1.amazonaws.com.